Helen & Tom wanted relaxed feel to their wedding stationery with a touch of glamour. We went for a watercolour style background with a focus on their names in a script calliagraphy style font. The glamour was added with champagne gold, glitter envelope liners. A5 flat invitation card with a A6 RSVP postcard. DL double sided order of service. A1 seating plans board. 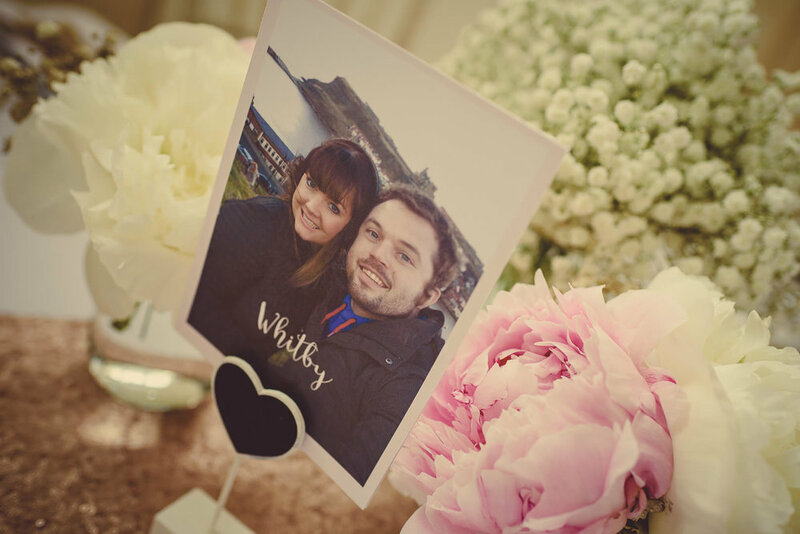 A6 photo table name cards with a pink overlay. Invite, RSVP & Order of service printed on Tintoretto Gesso, 300gsm white card. A1 5mm foamex mountboard with matt lamination. Smooth 300gsm card for table names.